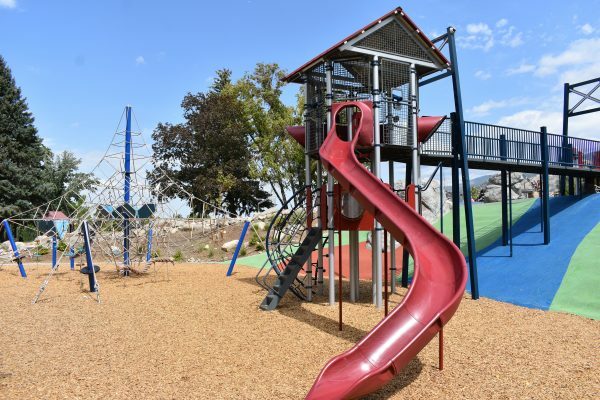 Creekside Park is a new park in Bountiful. 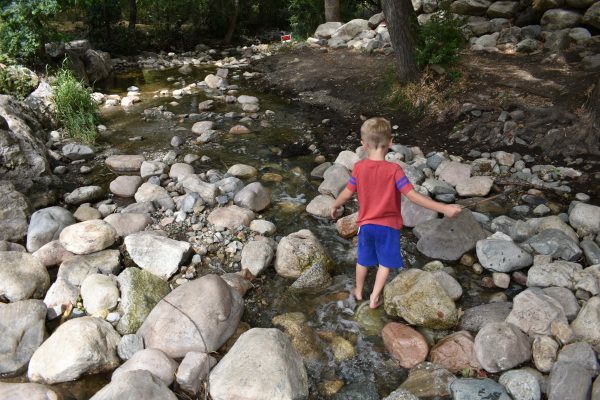 There are lots of fun things for kids of all ages to enjoy, including a small creek. 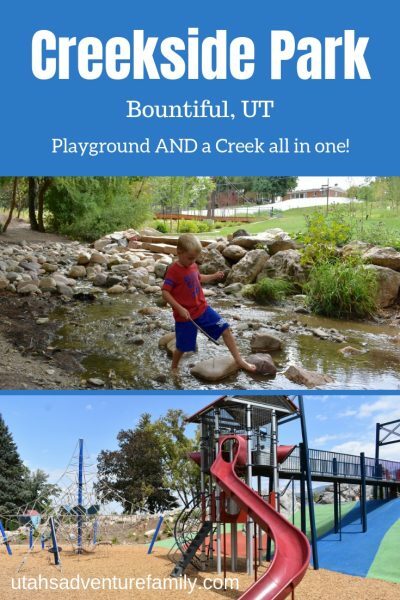 We actually visited three amazing parks in one day because they are all so close to each other: Creekside Park, Bountiful City Park, and Firefighters Park. 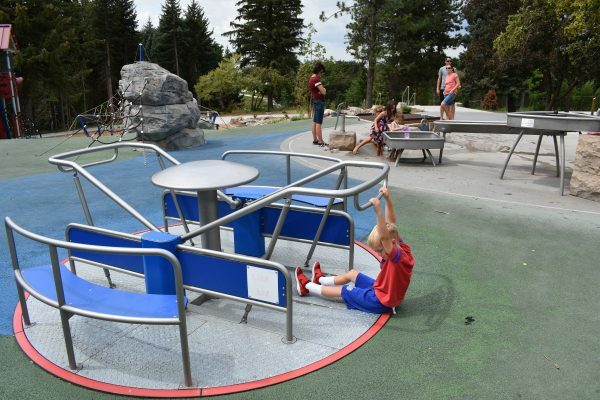 Creekside Park has lots of unique things at the playground. There is a small merry-go-round to spin on, a few swings, as well as a small water feature. The water feature is perfect for little ones, too. 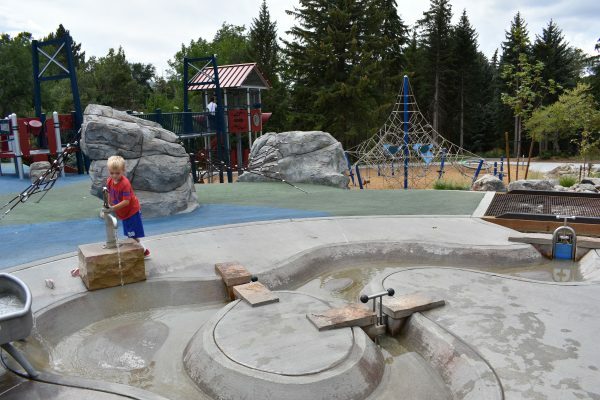 It has water pumps to pump water into buckets that drain out into a small river area where toddlers can splash. My older boys enjoyed it, too. The upper part of the playground has this spinning toy and a few others, too! We had a lot of fun playing with this water feature. There are a few swings, and you can see the trail that leads down to the creek. 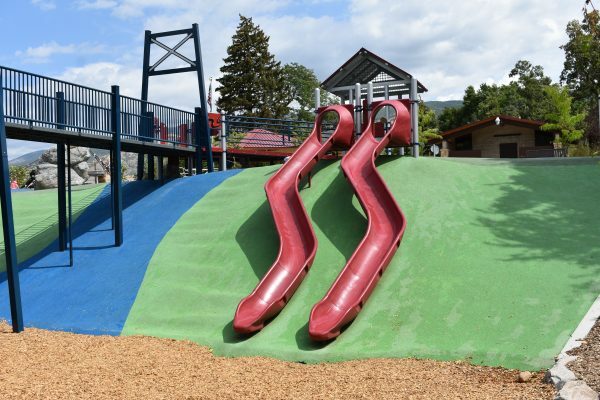 The main area of the playground is a three story play area. 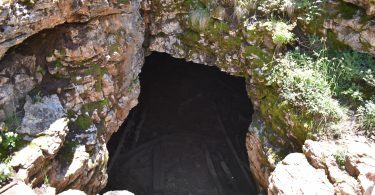 There is a bridge over to the tower that looks like the bridge over to the creek (info about that below).There are slides coming out of the tower, and a few extra slides on the hillside. The tower has different climbing places and fun toys to spin. Next to the playground is one of the rope climbing pyramids that are popping up at all the new parks. 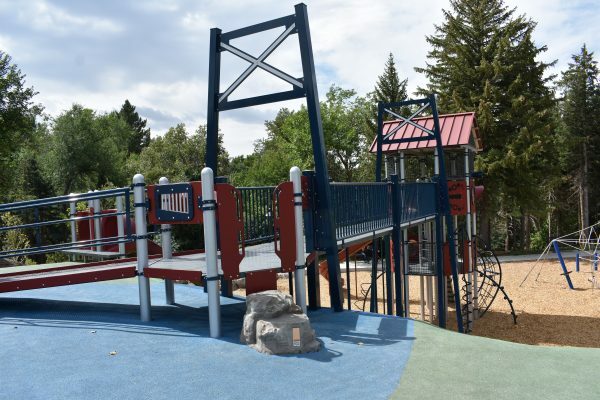 This bridge connects the upper area of the playground to the tower. 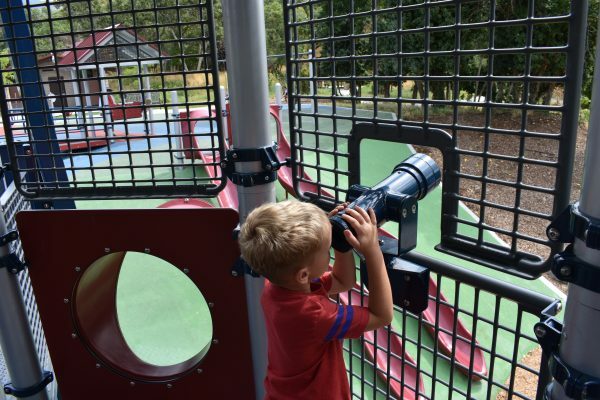 The tower has some really fun telescopes and other toys to play with while inside. You can slide down to the lower area of the playground if you don’t want to take the bridge. This playground is so much fun! There are benches, bathrooms, and a small pavilion near the playground. 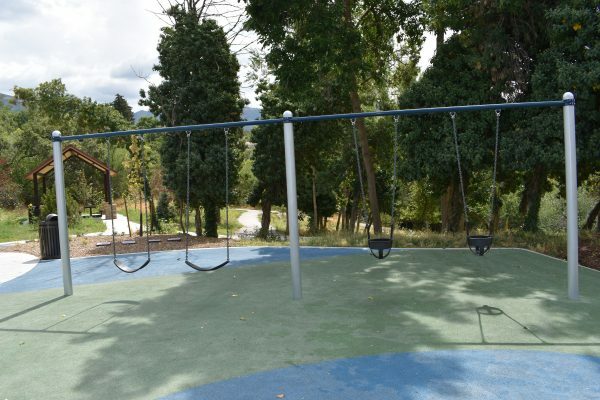 This park has a little shade and a little grass, but not much shade over the play area, so wear hats or sunscreen. The creek is obviously where Creekside Park got its name. The playground sits next to a small creek that runs between the houses. There is a paved path over to the creek. There are some stairs that take a quicker path, but there is a longer path that is stroller friendly, as well. 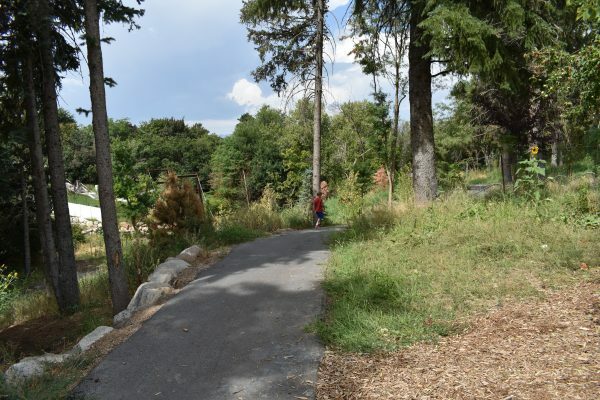 The path winds around the play area and down to the creek. The bridge is fun all by itself! 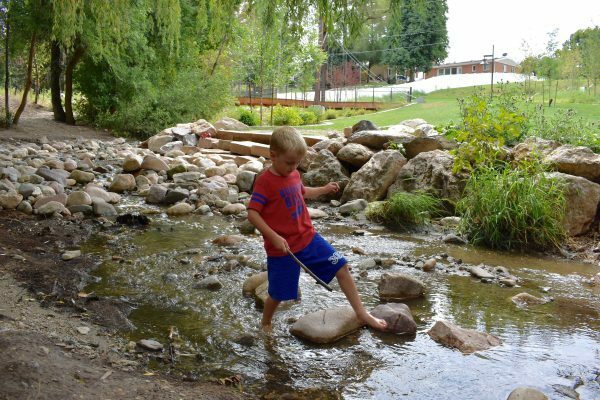 Once you cross the bridge, there are a few different spots to play in the creek. We had fun exploring downstream a little bit. We floated sticks and splashed in the water. 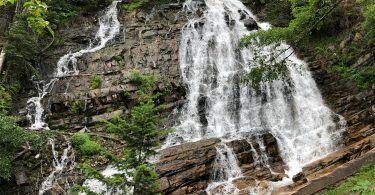 There is one area that has been blocked by rocks, so it is a little deeper and you can really get wet. 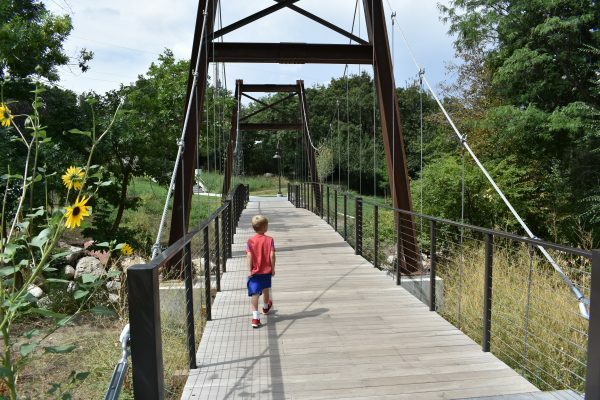 This was our favorite part of the visit to Creekside Park. Please respect the no trespassing signs that mark people’s private property. The creek runs under the bridge and between the neighborhood homes. We didn’t wear swimsuits, but we still enjoyed the cool creek water. Creekside Park is located at 600 E Mill St. in Bountiful. It is just southeast of Bountiful High School. Bring flip flops or water shoes for playing in the water. And maybe a towel to dry off your feet. Or if it’s summer, wear swimsuits and cool off!